There are more kinds of beetles on Earth than any other animal. But how much do you really know about them? Also called hind wings, they’re thin and delicate. When not being used, they fold under the elytra. But when it’s time to fly, these wings pop open and beat up and down rapidly. They’re called elytra (EL-ih-truh), and most beetles have them. Elytra are hard and tough. They protect the delicate flight wings underneath. Most beetles use them for smelling. But some can use them for tasting, feeling, or even swimming or fighting! They can be shaped like clubs, saw blades, feathers, or strings of beads. Like all insects, beetles have six jointed legs. Most beetles have two tiny claws on the tip of each leg for holding on. It’s liftoff! A scarab beetle flaps its wings and rises into the air. Beetles aren’t the best fliers in the insect world. But that doesn’t stop them from being among the world’s greatest success stories. Out of all the species of animals on our planet, three out of ten are beetles! They crawl, fly, hop, and swim on every continent except Antarctica. You’ll find them in forests, deserts, prairies, mountain regions, and even in your own backyard. Some beetles look strange. Parts of their bodies may grow horns, crests, spikes, or brushes. 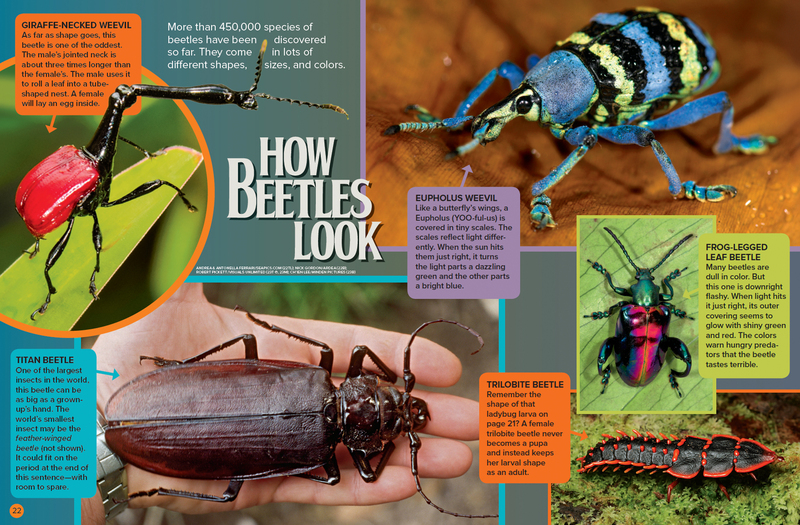 Several beetles have long snouts, and many are wildly colorful. Beetles do weird things, too. Some species eat dung, and a few even squirt out hot liquids. Isn’t it time you got to know some of these amazing creatures? All beetles start off as eggs. Most then go through three big changes called complete metamorphosis (met-uh-MOR-fuh-sis). The ­photos above show how this works for a ladybird beetle (also called ladybug). Each beetle hatches from an egg as a larva. The larva eats and grows and becomes a pupa (PEW-puh). Then, it emerges as an adult. different shapes, sizes, and colors. As far as shape goes, this beetle is one of the oddest. The male’s jointed neck is about three times longer than the female’s. The male uses it to roll a leaf into a tube-shaped nest. A female will lay an egg inside. One of the largest insects in the world, this beetle can be as big as a grownup’s hand. The world’s smallest insect may be the feather-winged beetle (not shown). It could fit on the period at the end of this sentence—with room to spare. Like a butterfly’s wings, a Eupholus (YOO-ful-us) is covered in tiny scales. The scales reflect light differently. When the sun hits them just right, it turns the light parts a dazzling green and the other parts a bright blue. Many beetles are dull in color. But this one is downright flashy. When light hits it just right, its outer covering seems to glow with shiny green and red. The colors warn hungry predators that the beetle tastes terrible. Remember the shape of that ladybug larva on page 21? A female trilobite beetle never becomes a pupa and instead keeps her larval shape as an adult. 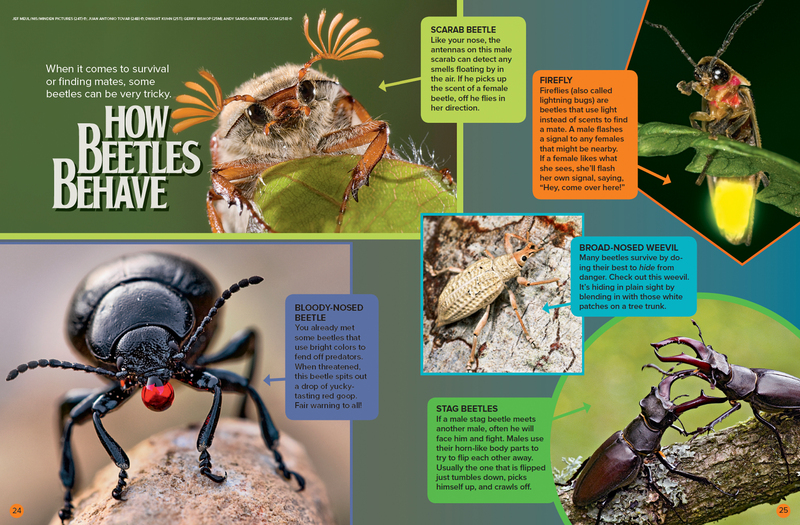 When it comes to survival or finding mates, some beetles can be very tricky. You already met some beetles that use bright colors to fend off predators. When threatened, this beetle spits out a drop of yucky-tasting red goop. Fair warning to all! Like your nose, the antennas on this male scarab can detect any smells floating by in the air. If he picks up the scent of a female beetle, off he flies in her direction. Many beetles survive by doing their best to hide from danger. Check out this weevil. It’s hiding in plain sight by blending in with those white patches on a tree trunk. If a male stag beetle meets another male, often he will face him and fight. Males use their horn-like body parts to try to flip each other away. Usually the one that is flipped just tumbles down, picks himself up, and crawls off. 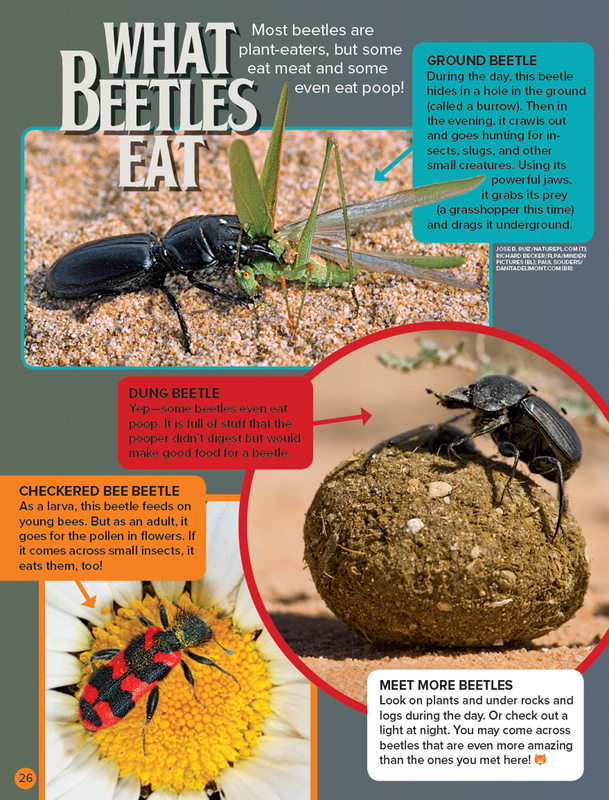 Most beetles are plant-eaters, but some eat meat and some even eat poop! During the day, this beetle hides in a hole in the ground (called a burrow). Then in the evening, it crawls out and goes hunting for insects, slugs, and other small creatures. Using its powerful jaws, it grabs its prey (a grasshopper this time) and drags it underground. Yep—some beetles even eat poop. It is full of stuff that the pooper didn’t digest but would make good food for a beetle. As a larva, this beetle feeds on young bees. But as an adult, it goes for the pollen in flowers. If it comes across small insects, it eats them, too! Look on plants and under rocks and logs during the day. Or check out a light at night. You may come across beetles that are even more amazing than the ones you met here! 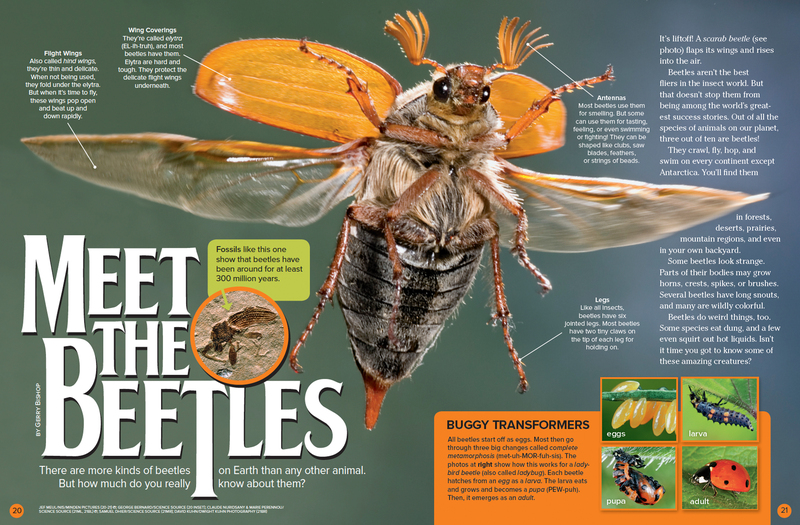 “Meet the Beetles” originally appeared in the September 2016 issue of Ranger Rick magazine.